Critics were asked not to discuss any specific aspect of the plot so I will leave it there. Suffice to say that there is some old, some new, some replicated and some Jakku. With the pressure of three all time classic films, almost four decades of reverence and over-analysis and yes, three mediocre prequels, director JJ Abrams faced a difficult task. Almost an impossible task. Give us the same different. We want new familiar. We want everything and nothing at the same time. Because we Star Wars fans are ‘old’ now. As old or older than the primary cast was in 1977. No-one can get the past back no matter how much we might sometimes want to. JJ Abrams is a prisoner to our dichotomy; we demand he revisit our best years while simultaneously warning him that we fear and resent all change. As fans we wanted to see the worlds that mesmerised us in our youth. But the kid that wore an Empire Strikes Back shirt with a hard plastic sticker of Luke on a tauntaun for over a year of my pre-teens more selfishly wanted the memories of that period to be untainted. The highest praise I can give is that while I don’t rewatch Star Wars as frequently as other movies, in the future I can see that the choice between Star Wars 1977 and Star Wars: The Force Awakens as not as clear cut as some would think. Yeah I said it. If you go in wanting to criticise I am sure you will have things to point at and scorn. If you go in wanting to be entertained there will be little standing in your way. Back to the ‘now’ version of Long, Long, Ago; the cast is strong with this one. 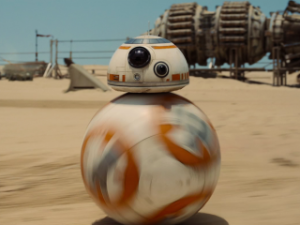 New kids Daisy Ridley as Rey and John Boyega as Finn stand out by fitting in – it is actually Oscar Isaac who seems to steal every scene in which he appears. There are also a bunch of other actors whose names you will see and recognise in the credits, but whose faces were changed beyond recognition under makeup and CGI. The cast is perhaps the only ‘new’ here. 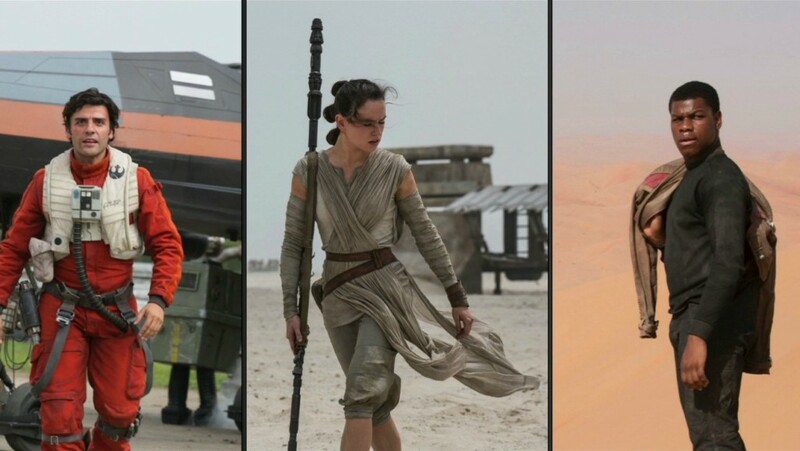 Almost every sequence of The Force Awakens has sets, costumes, lighting and props that could all have been lifted from those original stages. And when John Williams’ music enter, swells and builds you are momentarily lifted away on a personal reminiscing session that may sweep you back to when and where you discovered Star Wars for the first time. Further familiarity arrives with great frequency. While the settings are not at all the same the film has three primary worlds on which significant action takes place. I could call them Tattoine, Endor and Hoth and I would be wrong only in the names. There is also a cantina callback with all new creatures and what looked like the original cantina band fourty years on. That’s some house session. Thankfully the action is more of the conflict variety as opposed to the political posturing of the prequels, with a combo of land, space and saber battles. 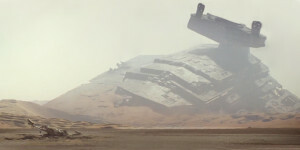 In fact perhaps the pivotal sequence involves a pitched air battle as seen from an in-progress land battle similar to the one in Jedi – although in this one both battles share the same screen. It is as close as this new film gets to a ‘wow’ moment, but this episode doesn’t need to reinvent the wow in order to work. It is dining off wows from the past. Remember New Coke? Me neither. We’ll stick with the classics thanks. Lightsabers are a mandatory element, along with weapons that go ‘peyoong’, X wings, capes, vehicles (and other future merchandise) all interspersed with the warm familiarity of (and I’ll get these wrong) Star Destroyers, Imperial Walkers and of course the three F’; the (Millennium) Falcon, Ford and Fisher. You might have guessed that there are many similarities with this new film and the one released 38 years ago. You might have also sensed that I am ok with that, which might place me in the minority, despite me bagging Jurassic World for essentially the same thing only a few months ago. Perhaps sensing this possibility, Abrams pulled off his masterstroke – “don’t just take my word for it. Here are some other famous people who agree with me”. 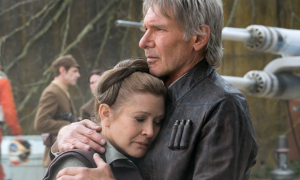 …And in the Star Wars universe they don’t get much bigger than Harrison Ford and Carrie Fisher. Yes they are obviously in the film in roles that they became famous for, but performing actions I will not describe here. However for a film that didn’t want details leaked in advance, Abrams was pretty careful to plonk Ford and Fisher front and centre in the immense promotional campaign as pre-emptory deniers of franchise betrayal. Perhaps also he worried that the ‘there can be only one trilogy’ fanboys would stay away and convince others to do the same. (It was incredibly sad that someone killed themselves when they found out a hero was black. My only gripe is how blatant the Nazi corollary is in one clumsy scene.) Fanatical outliers aside, he needn’t have worried. 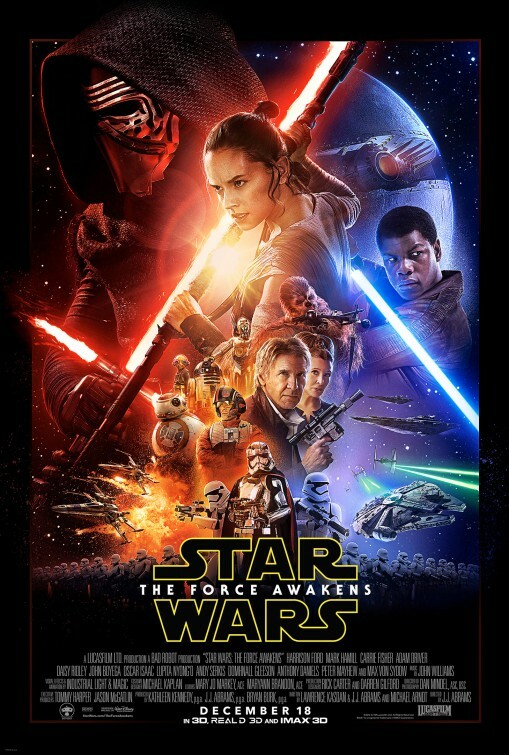 The quality of the film is evident, and the box-office seems to be going… OK. Personally, my only wish before the critical endorsements started flowing in was for Abrams not to stomp all over my childhood memories. Not only did JJ Abrams avoid that, he momentarily took me back there. I can give no higher praise. Final Rating – 8.5 / 10. I am not a JJ Abrams fan. I am a Star Wars fan. But I greatly appreciate the fact that Abrams made a film that not only fits into the Star Wars universe, but it builds a platform that others can expand upon. Jurassic World, Terminator: Genisys and any number of superhero movies (most notably Avengers: Age of Ultron) cannot say the same.